Morobe Governor Ginson Saonu told his people what they’d been wanting to hear for years. He has made a firm commitment to develop Morobe’s undeveloped tourism industry. It was exactly what the doctor ordered for Morobe. I know this for a fact, having widely travelled the province as a journalist, and having worked in the tourism industry. Saonu met with Tourism Promotion Authority CEO Jerry Agus and Defol Jabbar of the revitalised Morobe Tourism Bureau last week. An agreement will be signed next month to advance tourism in Morobe. “We will revive tourism in Morobe,” Saonu tells me, adding that the juicy details will be revealed later. Agus breaths a sigh of relief. He’s been trying to work with past Morobe leaders and public servants to develop tourism in Morobe but to no avail. “As you know,” Agus tells me, “Morobe is the largest province in Papua New Guinea in terms of landmass and population. “From a tourism perspective, Morobe has huge potential in terms of developing the industry, but over the years we really haven’t taken advantage of that. “We haven’t cashed in on the potential tourism has in Morobe, simply because there was no leadership and commitment at the leadership level and at the provincial administration level. Without being parochial, being a Morobean myself, Morobe has so much to offer. “In terms of tourism products, you have coastal tourism products like diving, surfing, snorkelling,” he tells me. “You have other products like trekking, birdwatching and very-important historical sites like WWII monuments. “History like the first arrival of missionaries in Finschhafen and all that. “Morobe has some unique products you can’t find anywhere else in PNG like the mummified bodies in Aseki and Menyamya. “From a tourism perspective, Morobe has most of the things that can really attract tourists. “It doesn’t need the provincial government or leaders on the ground to do a lot of work because most of the basic infrastructure, you already have them. “It’s just a matter of us organising ourselves, developing those basic products and getting it out to market, having a proper office in Lae to coordinate all these activities. “I know there are a lot of passionate Morobeans out there who are keen to throw their support behind any tourism movement or any initiatives that we undertake. “To really go into that full swing, we really need the support of leaders on the ground. “We are really excited that the governor is really passionate to grow tourism in Morobe. “The next thing we need to do is to cascade down to the provincial government level and ensure that our provincial administrators and people embrace the importance of tourism and what tourism can do. “All the industry members, I’m sure, will really fit in. 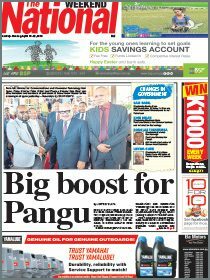 “It’s good news for Morobe when the governor is talking tourism and embracing the importance of tourism. “Then everybody can come together. “For Tourism Promotion Authority, we are looking for partners that we can use as a vehicle to drive our tourism agenda. “If the governor is talking about tourism, then there is no reason why we should shy away from partnering with him to develop tourism in Morobe. “Some years back, in terms of tourist numbers, Morobe was doing very well. “We had Black Cat Track and very important historical sites like Finschhafen, for instance, where there are a lot of church gatherings. “These are some of the things that we can build up on, but because of lack of leadership and lack of support, the tourism bureau in Morobe has closed its doors. “There is no tourism awareness or tourism training going on. “TPA as an organisation cannot do these things alone. “We need partners on the ground. “If we choose to do something, and we leave the place, everything will go back to its normal state. “What we want to do is partner with people who are keen or interested in tourism. “It’s very good timing for us because the governor has given the thumbs up. “We are looking forward to signing the MOU sometime in the first or second week of September with the governor. “After that, we will work closely with the provincial administration and other stakeholders to develop the tourism plan for Morobe. 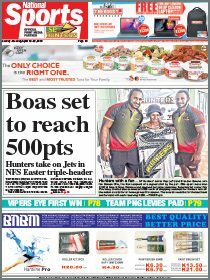 From Menyamya to Siassi, and from Kabwum to Morobe Patrol Post, this is something that’s long overdue. The sleeping giant that is tourism is about to be awoken in Morobe.